The trick to keeping your room looking modern is to keep things simple, sleek and to the point. Typically, modern kitchens display flat-panel doors or slab doors with minimal detailing. It wouldn’t make sense to have an ornate knob throwing off the simplicity of the room style, just as you won’t see much detailing on the cabinetry – so make sure you choose your hardware carefully. While many people opt for no visible cabinet hardware on their modern cabinets, the style can also be kept with the right hardware. Long, linear designs, such as tubular or flat pulls, complement the modern style nicely – or, you may even opt for recessed pulls. Take a look at some of these simple hardware options to use with your modern cabinets: Top 9 Hardware Styles for Flat-Panel Cabinets. When choosing your hardware (if any), make sure you also keep in mind existing finishes in your room (such as your stainless steel refrigerator or your brushed nickel light fixtures). While your hardware doesn’t have to match exactly, you’ll want to keep everything complimentary of each other. 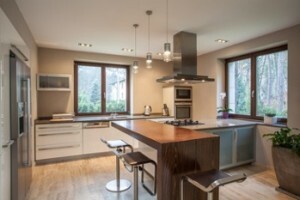 Do you have a modern kitchen? We’d love to hear about your hardware choices in the comments below.